Despite starting out last season as a proficient rusher while filling in for Le’Veon Bell, veteran running back DeAngelo Williams currently finds himself without a team heading into the 2017 season. Free from the training camps and tape sessions of a more traditional off-season, Williams has decided to use his spare time on pursuits outside of football, and found good use of it inside the ring. 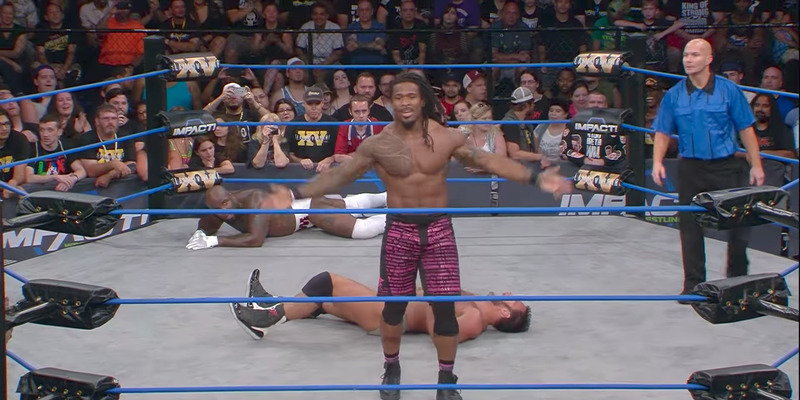 On Sunday, Williams made his wrestling debut at Impact Wrestling’s Slammiversary XV. One of the biggest shows in wrestling outside of WWE, Slammiversary is quite a show to make your first, and Williams did not disappoint. 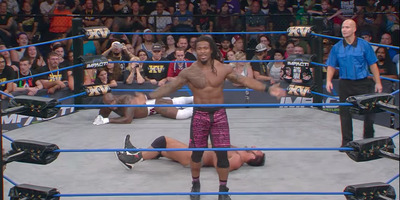 Williams paired up with Moose, also known as fellow former NFL player Quinn Ojinnaka, in a tag team match against Chris Adonis and Eli Drake. The moment Williams first tagged in, it was clear he was meant to be in the ring. While highly choreographed, his first sequence is as smooth as any you’d see from professionals that have been in the business for some time. Williams’ athleticism shines through as he makes difficult tasks look effortless. You can watch a few highlights from that first sequence below. Williams was close to executing a perfect wrestling debut, and as Moose set up their opponent on a table in the ring, it looked like he might pull it off. Unfortunately, Williams underestimated his own strength while setting up a frog splash onto the table, and ended up overshooting his mark and came very close to hurting himself. But despite the miss, Williams was able to collect himself and get the pin. For now, Williams still plans on playing this NFL season, telling Adam Schefter, “I’m waiting on the phone call. With a GM, or head coach, or whoever decides they need my services. I’ll be ready. You can rest assured of that.” As a veteran, three-down back that knows the league and can be signed for a relatively cheap contract, Williams would surely be an asset to more than a few teams still looking to put the finishing touches on their roster. But if no one calls, or if Williams changes his mind and feels like hanging up his cleats sooner than expected, he’s already more than proven that he could be a great wrestler if he decided to pursue it.